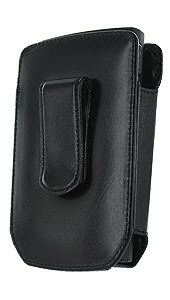 to-the-nearest-Star-Trek-convention became "in"), I've observed that it's trendy among middle-aged, upper class businessmen to carry their larger-than-life phones in a nifty hip holster (just in case a situation should arise when they must challenge the small-minded middle class to a quick draw). But, as strong as the trend may be, and as much as the belt clip serves a function of utility, I just can't help feeling like I'm not important enough to walk around with a phone attached to my hip. I'm just not ready for that kind of commitment. In the meantime, I'm reduced to carrying my phone everywhere because it's too big to fit in my pocket, and using a belt clip is, well, the reason for my rant. If any of you have any guidance for my quandry, please feel free to post your comments. You could alway go with an ankle holster. It could be like a concealed weapon. You know that some say knowledge is power and that little (well larger than most) cell phone has access to a whole lot of knowledge. However it might be a bit awkward having groovy ringtones coming from your shoe tops. Even more awkward having to answer it. That is why I put my phone on vibrate and use bluetooth. Your quandry resonates with me as well my friend. My current cell phone is not big enought to warrant a belt clip but I do plan on making a purchase soon and upgrading to a phone that can perform miracles and would need a belt clip and I have already began to ponder the implications. As of now I still can't do the belt clip thing - it just looks too important or too techy like you said and I am neither. I do like the Bluetooth scene but I am one of those paranoid types that wonders if a little thing attached to your ear/head 24/7 won't cause cancer down the road. I have just realized that this comment has offered you no advice - but perhaps there is solace in knowing you are not alone in your belt clip misgivings.